We're celebrating female friendships this Galentine's Day. With "Galentine's Day" coming up, celebrating friendship and sisterhood is now more important than ever! The author of "The Single Woman" shares what to do and not do on Feb. 14. Live your best life this Galentine's Day. The holiday, designed to shine light on some of the most trusted and true friendships in your life, inspired us to reflect on the most prominent female bonds in Hollywood. From Beyonce and Kelly Rowland's long-lasting friendship dating back to their Destiny's Child days to Ariana Grande's tight bonds that inspired her hit song, "7 Rings," check out some of our favorite Hollywood BFFs! The pair has been close since their days starring on "Dawson's Creek." They've celebrated milestones together, like weddings, having kids and new career moves. They've also supported one another through the toughest times, like when Williams lost her partner Heath Ledger in 2008. Philipps is godmother to Williams' daughter, Matilda Ledger. (Stephane Cardinale/Corbis via Getty Images) Busy Philipps and Michelle Williams attend the Louis Vuitton show as part of the Paris Fashion Week Womenswear Spring/Summer 2018, Oct. 3, 2017, in Paris. Williams told PEOPLE about their inseparable bond last year. "Someone had said, ‘When you two meet, there is going to be a chemical reaction.’ I had been really excited for this girl to land in Wilmington [North Carolina]," she shared on their initial meeting while starring on "Dawson's Creek." “We became inseparable and I fell in love with her,” she continued. Found her. Happy birthday to my better half. I love you, M. You make everything better. ?? "I said to her recently, ‘you have really saved me from every being lonely because you are always right there,'" she added. "We are so close and can tell each other everything. I don’t know what I would be or who I would be without Busy." "Black Panther" co-stars Gurira and Nyong'o are extremely close. In a birthday post to Nyong'o last year, Gurira called her friend, "beauteous, incomparable, indomitable." 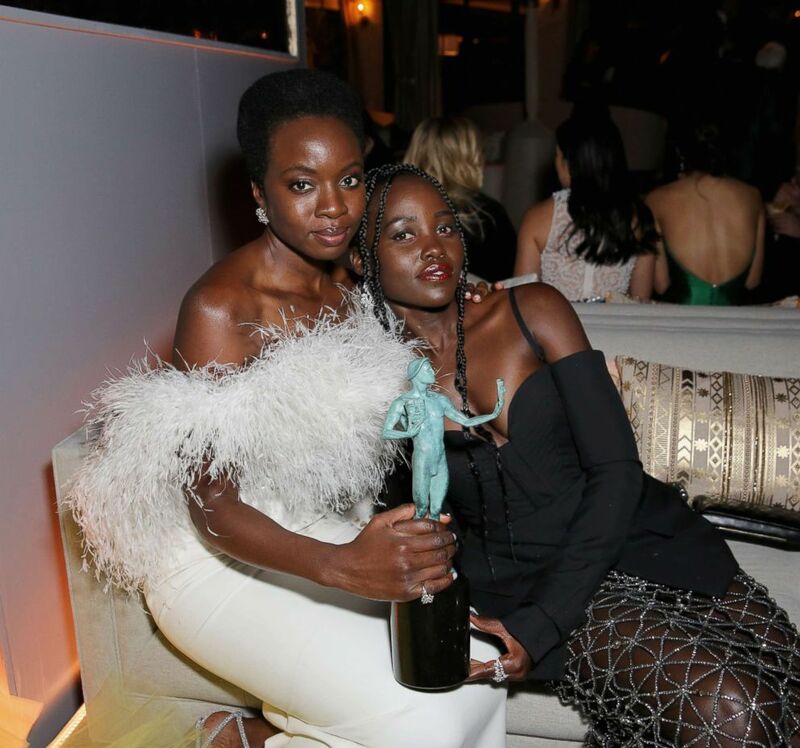 (Rachel Murray/Getty Images for Netflix) Danai Gurira and Lupita Nyong'o attend the Netflix 2019 SAG Awards after party, Jan. 27, 2019, in West Hollywood, Calif.
She also orchestrated a special happy birthday message during the 11th annual ESSENCE Black Women In Hollywood Awards the duo attended. Both on and off-screen, this famous "Friends" trio embodies friendship goals. (NBC via Getty Images) Jennifer Aniston as Rachel Green, Courteney Cox Arquette as Monica Geller, Lisa Kudrow as Phoebe Buffay on "Friends." Most of the hit show's cast have remained close since the series finale in 2004. Grande is so tight with her girl group that she wrote a song about it! "7 Rings" was inspired by an afternoon the pop star spent with her close group of friends in New York City last year. "'Twas a pretty rough day in nyc," she tweeted in December. "My friends took me to Tiffany’s. We had too much champagne. I bought us all rings. It was very insane and funny." (Ariana Grande/YouTube) Ariana Grande in her music video for "7 Rings." Grande’s friends, including Courtney Chipolone, Victoria Monet, Alexa Luria, Tayla Parx, Njozma and Kaydence, are featured in the star’s music video, and Grande often speaks about how important the group is to her. Makeup mogul Kylie Jenner and model and entrepreneur Jordyn Woods are so close that when Jenner told Woods she was pregnant, Woods replied, "Okay, well I guess we‘re both having a baby,” according to Jenner. I only keep a bad one on my side???? "Whether we like it or not we're stuck together forever," Woods captioned a post of them on Instagram in 2017. The two starred on "7th Heaven" together in the 90s and early 2000s and their friendship has lasted since. In a blog post in 2016, Mitchell explained her deep connection with Biel. "Jess and I got along from the start, we truly were the best of friends," she wrote. "I mean THANK GOD for this girl, we have truly gone through it all and I couldn’t have picked a better partner to have had this adventure with." (Jon Kopaloff/FilmMagic/Getty Images) Jessica Biel and Beverley Mitchell helped LG Mobile Phones celebrate Sirens & Sailors fashion show and cocktail reception, Aug. 7, 2003. "She has loved me through the best and worst of times and has always been there when I needed her," she added. "20 years ago I was given a sister and I couldn’t have asked for a better one!" The "Riverdale" co-stars now consider one another good friends, but it wasn't that way from the start. "We both come from such different backgrounds that I think it took us a while to find some common ground," Mendes told J-14. (Chris Delmas/AFP/Getty Images) Camila Mendes and Lili Reinhart arrive for the press line of "Riverdale" at Comic Con in San Diego, Calif., July 21, 2018. "But once the walls came down and our inner goofballs began to reveal themselves, we were unstoppable, and now it's almost like we speak our own language," she continued. Comedic duo Fey and Poehler remain the best of friends year after year. “When we’re next to each other, we like to hug each other a lot, like we’re in the womb, and Tina’s thumbprint matches my pinky, because that’s what we were like in the womb,” Poehler joked about their relationship to Entertainment Weekly in 2013. (Art Streiber/NBC/Getty Images) Tina Fey and Amy Poehler host the 72nd Annual Golden Globe Awards, Jan. 11, 2015. 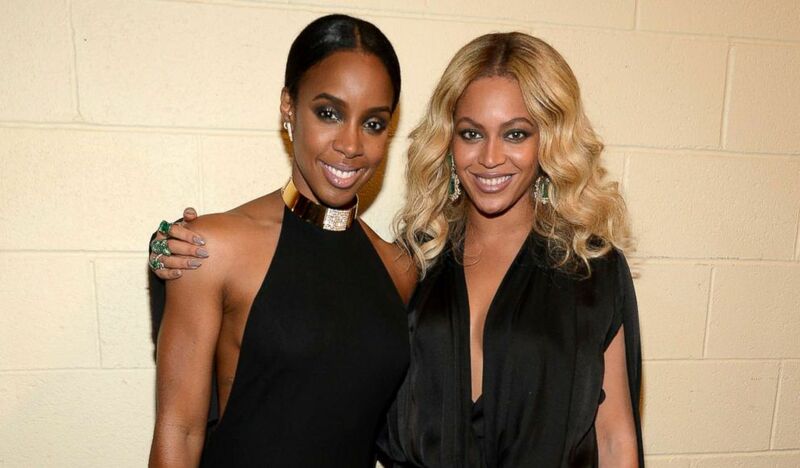 Beyonce and her former Destiny's Child bandmate Kelly Rowland remain important in each others lives. (Kevin Mazur/Getty Images for Roc Nation Sports) Kelly Rowland and Beyonce attend Roc Nation Sports, Golden Boy Promotions, Miguel Cotto Promotions And Canelo Promotions Present Miguel Cotto vs. Canelo Alvarez, Nov. 21, 2015, in Las Vegas. Beyonce recently shared a loving birthday tribute for Rowland. "I love you Deep Deep," she wrote. "BIG deep. Me and you, us never part, Makidada. Walking through them middle school hallways like “Rollin Rollin Rollin."" The post featured several loving snaps of the two over the years. Happy Birthday Kelly! ?? I love you Deep Deep. BIG deep ?? ? ?Me and you, ???? us never part, ???? Makidada ?? ?????? Walking through them middle school hallways like “Rollin Rollin Rollin” ?? The stars of HBO's "Big Little Lies," Reese Witherspoon, Shailene Woodley, Nicole Kidman, Laura Dern and Zoë Kravitz, have formed an incredible bond since starting filming the show in 2016. Although the show portrays major drama among the female characters, there is nothing but love with the group of megastars in real life. "I feel such sisterhood with the girls — we deeply love each other, and for Reese and Nicole and I particularly, all having done this since we were teenagers and never having acted with so many women, it’s amazing," Dern told Vanity Fair in 2019. Another pair whose friendship has remained constant for years? Nina Dobrev and Julianne Hough. Dobrev was one of Hough's bridesmaids in her wedding in 2017. (Michael Tran/FilmMagic/Getty Images) Nina Dobrev and Julianne Hough speak onstage during the 2016 American Music Awards, Nov. 20, 2016, in Los Angeles. “It feels like we met when we were 2 years old, because I feel like I have known you my entire life,” Dobrev told Hough during a joint interview with PEOPLE in 2018. “We are goofy, we like to laugh, we like to play with our dogs and hang out and watch movies and get ready together and go places together. We just like to be around each other."